Congratulations on your pregnancy! The first trimester is an exciting, but often exhausting time. There is quite a bit to do and know during your first trimester, so use this list of 10 first trimester pregnancy tips to make it easier and set yourself up for an enjoyable second and third trimester! This post contains affiliate links. You can read our full disclosure at the bottom of the post. 1. Choose a Prenatal Care Provider. Your prenatal care will be close to a year in duration so choose your provider with care. You’ll want to choose a physician or midwife that is experienced and has a good reputation in your area and with friends or family. When choosing a provider you will want to be sure you both share the same philosophy about your pregnancy, labor, and delivery. Think long-term. 2. Make Your First Prenatal Appointment. Call your doctor or midwife and set up your first prenatal visit. Use the time before your visit to learn about first trimester pregnancy information. Make sure you have the paperwork for your first visit, ahead of time. You can save a tremendous amount of time if the information has been researched and filled out to the best of your knowledge. Make sure you and your partner’s medical history includes any history of genetic disorders, medical illnesses, allergies, medications, surgeries, exposures (ie. X-rays), etc. Fill out all the forms well ahead of time as there will be questions you may have to research or ask family members. Make every effort to have your partner come to the appointment. The amount shared at the first prenatal visit is extensive and it will be very difficult to remember everything you will want to share with your partner. Schedule your first appointment at the beginning of office hours to make sure you get the allotted time you need or immediately after lunch. Never at the end of the morning office session. The last appointment of the day may allow more time since no other patients will be waiting. The last appointment of the day may also be a good option if your partner cannot take time off from work. 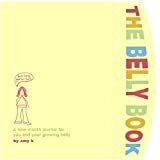 Books as many prenatal appointments at one time as possible. By doing so, you will get the appointment times that best fit your schedule. Book your appointments early in the day. If you do this, your provider will less likely be running behind and this may reduce your wait time. Try to schedule appointments on days when more than one provider is in the office. All it takes is one emergency to disrupt the office schedule if there is only one provider in the office. 3. Make a list of questions to ask your provider. Make a list of questions to ask your provider at your first visit. There are often many first trimester pregnancy questions, especially with your first pregnancy. Who will deliver my baby when I go into Labor? Do the providers in your practice manage labor from home or if there always one provider present at the hospital? How do you manage patients who go past their due date? If I require urgent medical care during my pregnancy, at what facility will I be evaluated at and who will manage my care if my provider is not available? This is also a good time to start a pregnancy journal so you can write down the answers to these questions. In addition to the baseline prenatal tests that are done during the first trimester, there are a number of other prenatal tests that will be discussed with you during your first prenatal visit. This list of prenatal tests is constantly evolving as technological advancements are made using blood testing, genetic testing, ultrasound evaluation, etc.. Try to familiarize yourself with the prenatal tests and medical conditions listed on your medical history form as this information will be discussed with you based on you and your partner’s relevant screening criteria such as genetic history, ethnicity, etc.. If you haven’t started taking a prenatal vitamin, you will want to start taking one now. If you find it a struggle to take pills, try a gummy version. They are often better tolerated, especially if you are experiencing morning sickness. It is important to take your vitamin to ensure you get enough folic acid. Folic acid reduces the risk of your baby developing neural tube defects. 5. Be prepared for morning sickness. Morning sickness also called nausea and vomiting of pregnancy is common during the first trimester. “Morning sickness” can strike at any time of day. There are things you can do to relieve your morning sickness. Eat a small number of crackers before you get out of bed. Try to eat more carbohydrates, like bread and pasta. Avoid spicy and greasy foods. Try ginger tea or ginger ale to settle your stomach. 6. Have a plan to handle fatigue. First trimester pregnancy fatigue is very common. Fatigue is an indication you may need more rest. 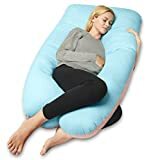 Take naps when you feel tired. Pregnancy is tough and your fatigue is real. Naps are great for rebooting yourself in the afternoon. 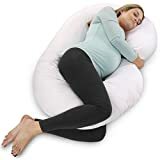 A pregnancy pillow can help you feel more comfortable and sleep better. Eat small, well-balanced meals several times a day. Include both protein and carbs to help keep your energy levels up throughout the day. Cut back on activities and chores. It is OK to say “No”. If it doesn’t have to be done, it can wait until you have more energy or someone else can do it for you. Sit down frequently and put your feet up. 7. Learn what foods to avoid during your pregnancy. You already know it is important to eat a healthy, well-balanced diet, but it is even more important when you become pregnant. Keep in mind that you are eating for two. The healthier you eat the better it is for you and your pregnancy. Foods that are not pasteurized- Brie, etc. If you are ever unsure of the foods you can eat, ask your doctor for a list of food items to avoid during pregnancy. Drink more water and balance your free water intake with adequate electrolytes (Gatorade etc.). Discuss fluid intake with your provider. If you don’t like plain water, try a water infuser. You can infuse your water with a variety of fruits and pregnancy-safe herbs. LA Organics Fruit Infuser Water Bottle is the one I like best. Eat fruits and vegetables. They are a great way to stay hydrated, Watermelon, orange, and cucumber make great choices. 9. Quit smoking and stop drinking alcohol. Smoking and drinking at any time during pregnancy can be harmful. First trimester pregnancy exposure is particularly concerning in terms of early development. Studies show that smoking and drinking alcohol have negative effects on pregnancy (miscarriage, impaired placental function, low birth weight, preterm birth, etc.). 10. Get your support system in place. The first trimester pregnancy can be tough. It can be exhausting. You’ll need a good support system. You will want to get your spouse or partner on board to help. Growing a tiny human is hard work. Be sure to reach out to friends and family and ask for help. Say no to social engagements if you are too tired. Let other people cook and do childcare for you. If it doesn’t have to be done by you, delegate activities to a member of your support team.